An excellent interview with Sonia Sabri features in the January issue of Arts Industry magazine. In the article Sonia light-heartedly reflects on her own training, the formation of Sonia Sabri Company and some of the memorable moments since the company’s conception in 2002. 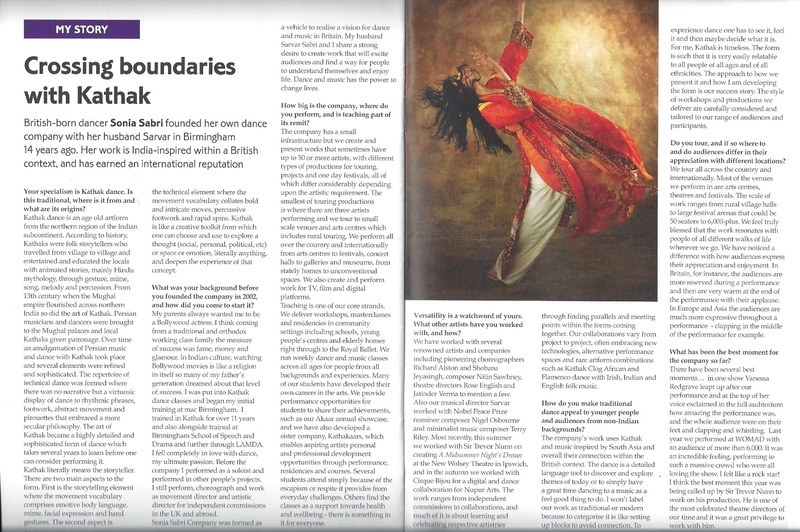 The history of Kathak is also touched upon as Sonia describes the evolution from a storytelling device to a classical art form. The interview also offers an insight into Sonia’s own history and relationship with dance before the formation of Sonia Sabri Company. Sonia goes on to talk about the company’s commitment to presenting South Asian inspired music and dance in an energetic and exciting way, discussing how the company’s work can appeal to people of all ages and cultural backgrounds. The article is a wonderful reflection of the company’s work and Sonia and Sarvar’s commitment to producing high quality, innovative art and learning opportunities. Arts Industry magazine is the only magazine available both in print and online for Britain’s cultural community. The magazine provides articles and interviews as wells as the latest news and job vacancies.